HÀ NỘI — Việt Nam beat Hoàng Anh Gia Lai FC 3-1 in an International U19 Football Tournament match that saw both sides being reduced to 10 men in Nha Trang City yesterday. 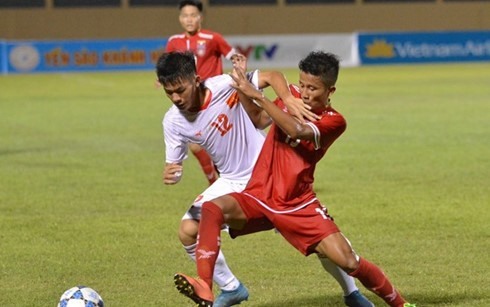 The national youth team had no difficulty breaking Hoàng Anh Gia Lai’s net in the sixth minute. Danh Trung took advantage of a misunderstanding between Hoàng Anh Gia Lai’s Văn Lợi and midfielder Trung Nghĩa to strike into an empty net. Captain Văn Xuân was sent off at the 30th minute when he grasped Hoàng Anh Gia Lai striker Hoàng Tú in an attempt to prevent him from scoring. The shortage of players, however, did not affect Việt Nam’s power. They continued to score in the 65th minute by Văn Công and 79th minute by Xuân Kiên. Hoàng Anh Gia Lai also had to play with 10 men when in the 65th minute Trung Nghĩa was given his second yellow card. Bảo Toàn netted the only goal for Hoàng Anh Gia Lai about 20 minutes after the break. In an early match yesterday, Chinese Taipei lost 0-2 to Myanmar. With three wins, Việt Nam top the ranking with nine points and will take a slot in the final. They will play second-placed South Korean Gwangju FC tomorrow in the group’s last round match.